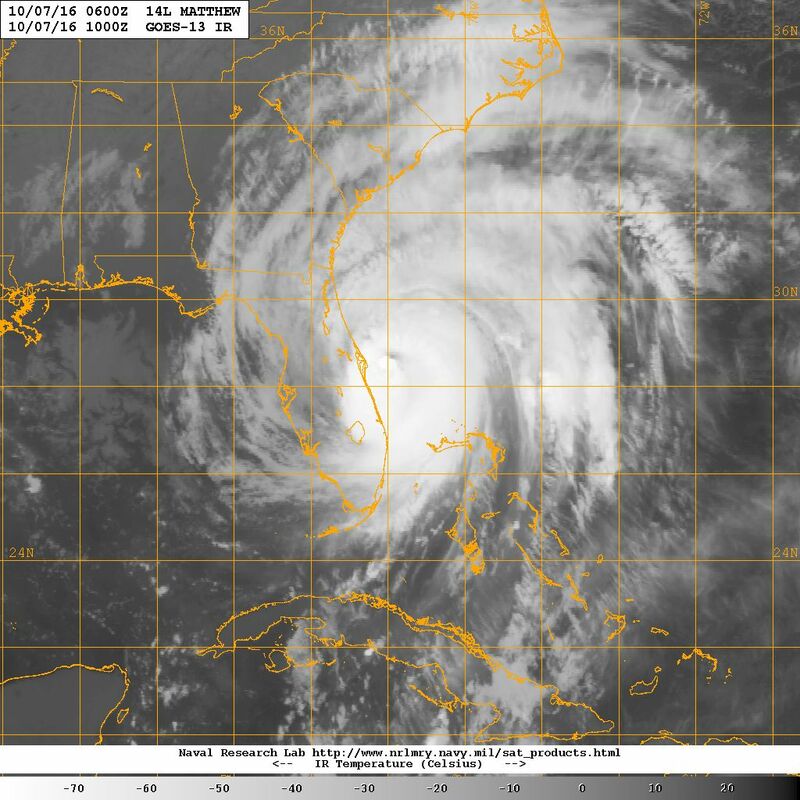 The U.S. Navy released a GOES-13 satellite image of Hurricane Matthew along the Florida coastline. At 500 AM EDT (0900 UTC), the eye of Matthew was located near latitude 28.2 North, longitude 80.0 West. It is moving toward the north-northwest near 13 mph (20 km/h), and this general motion is expected to continue today. A turn toward the north is expected tonight or Saturday. On the forecast track, the center of Matthew will be moving near or over the east coast of the Florida peninsula through tonight, and near or over the coasts of Georgia and South Carolina on Saturday. Maximum sustained winds are near 120 mph (195 km/h) with higher gusts. Matthew is a category 3 hurricane on the Saffir-Simpson Hurricane Wind Scale. Although weakening is forecast during the next 48 hours, Matthew is expected to be a category 3 hurricane as it moves near the coast of Florida today. Note: You can click on the photo to enlarge.